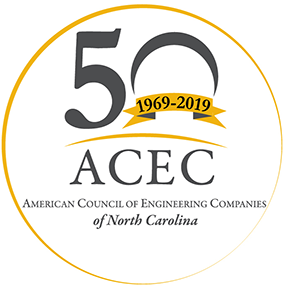 Sponsorship of the ACEC/NC NCDOT Transportation Conference provides your firm the ability to enhance its image with engineering professionals from across the state. Below is a list of sponsorship opportunities that will demonstrate your support and affiliate your firm with the ACEC/NC NCDOT Transportation Conference. Registration for non ACEC/NC member firms will open August 1st. PLATINUM SPONSOR $3,000 SOLD OUT! GOLD SPONSOR $2,000 SOLD OUT! 1/2 price LOBBY LEVEL exhibitor booth ($750 will be billed separately) with a map pin on the app highlighting your booth location. SILVER SPONSOR $1,000 SOLD OUT!